In a definite setback for their ethos, the violent Palestinian riots over the past week were mis-founded: Israeli Health Officials from the Abu-Kabir Forensic Institute announced today that Arafat Jaradat's death last week was not the result of poisoning or physical violence against him. Palestinian administrative detainee Arafat Jaradat's autopsy found no evidence of poisoning or physical violence, stated a report released by the Health Ministry on Thursday. So who can we blame? Settler violence [TM] and Price Taggers [TM]? The Shai District Police found that the alleged "price tag" incident which took place at the West Bank village of Kusra was fabricated. Fair readers, do not be alarmed. There many do-gooders over at Haaretz concocting new slanderous stories as you read these very lines. 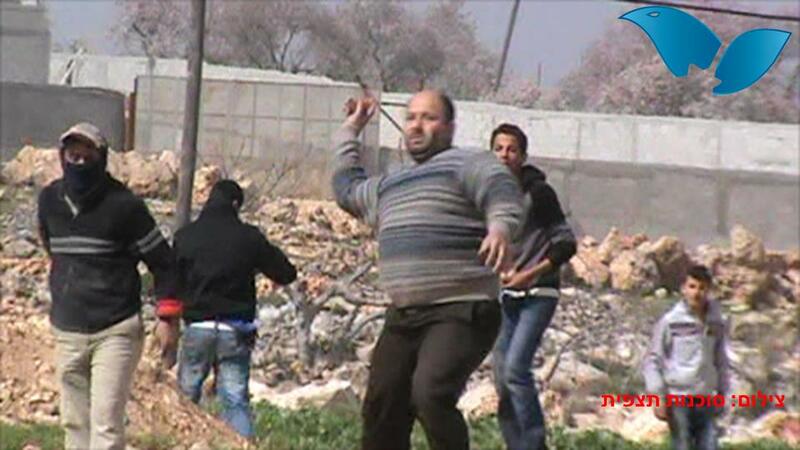 But here's a photo of Palestinian violence below....just in case you want to remind yourself what's really going on. Has American society become insanely hypersensitive? Around a year ago, I was lambasted on the blog for calling a girl a "girl" in a post I wrote, instead of calling her a woman, even though the other female readers of this blog freely use the pejorative "girl" for girls of the same age as the one I talked about. In the comments I exposed that double-standard, but at the time I don't recall mentioning the insane hypersensitivity and political correctness that drove the response. This week I watched with amazement two other incidents (not involving me) showcasing more examples of this hypersensitivity and insane political correctness. In the first case, Dov Hikind dressed up for Purim as a basketball player. A black basketball player, mind you. And for that he's going to hell, and his career is almost certainly damaged. Because apparently you can dress up as anything on Halloween or Purim, except as a black man (or am I supposed to say African-American). In the second case, Seth MacFarlane made some amusing jokes about Jews controlling the Hollywood movie industry, during the Oscar ceremonies. As a result, he was attacked for it by the Jewish watchdogs. What?! Are you people insane? A comedian suddenly can't make jokes about something that is pretty darn near close to true, or certainly used to be. This hypersensitivity is out of control. Neither man had any racist intent in their acts or statement. Neither were aware that what they did would be considered racist or insensitive. And why should they have? People don't costume up as Chassidim? As Italian Mafiosos? As Arabs? As Rastafarians? You can get all those costumes in the store. But a black man is off limits? Or is it that costuming as a black basketball player if off limits because it's a stereotype. Though what kind of stereotype can it be when 78% of basketball players are black? And look how many Hollywood producers and actors are Jewish (or of Jewish descent at least). You've got to be an idiot to not see that. But apparently it's now wrong to point that out. (Unless you're John Stewart, in which case it's OK, presumably because he's Jewish). Is it going to be racist to point out how many Jewish Nobel prize winners there are? Is that an offensive stereotype too? It really is time that this hypersensitivity got toned down, and save it for real racism. The "Adloyada" Celebrations in Tel Aviv in 1932-34. Particularly interesting are the floats mocking the Nazis, complete with giant swastikas, and warning of the impending disaster in Europe. While the rest of Israel celebrates Purim this Sunday (the 14th of Adar), Jerusalem celebrates on Monday (the 15th of Adar). Well, the easy answer is "because Jerusalem is a walled city from the time of Joshua." Which is partially right. Jerusalem was a walled city in the time of Joshua, but the walls we see today were built in the 1500s, in the Ottoman Era. From the early 13th century and until the mid-16th century, Jerusalem was not a walled city at all. And indeed, it was unclear to the Jews of that time when they should celebrate Purim. Rabbi Eshtori Ha-Parchi of the 14th century tells us that when he came to Israel, he was told that in Jerusalem they celebrated on both the 14th and 15th of Adar, as they were uncertain which one they were obligated to keep. Rabbi Eshtori brings an entire Halachik discussion about what should be done, and adds that he wrote his rabbi, Rabbi Matityah in Bet-Shean, to ask him what he should do. Rabbi Matityah wrote him back: If I would be in Jerusalem on the 14th of Adar, and they would read the Megillah, I would leave the synagogue. Otherwise they could say about me "The fool walketh in darkness" (Ecclesiastes 2, 14). And the same is true for Tiberias. Rabbi Eshtori finished by saying that Rabbi Matityah is right. We don't know what changed the minds of the Jews of Jerusalem, but today there is no doubt - and we celebrate Purim in Jerusalem on the 15th of Adar. Back in 2009, I posted about a huge scam in Israel -- the "billion dollar lifepatch" which could "predict" heart attacks and send a warning via mobile phone to the hospital. One didn't have to be a cardiac surgeon to quickly understand that the lifepatch was nothing more than a get rich quick scheme, but I'm baffled that so many people fell for this gimmick. I'm not surprised that Israel's president, Nobel Prize winner Shimon Peres gushed about this huge "breakthrough" -- he still continues to believe to this day the same about the Oslo accords and his agreements with his co-winner of the Nobel prize, Yassir Arafat were a mega success. 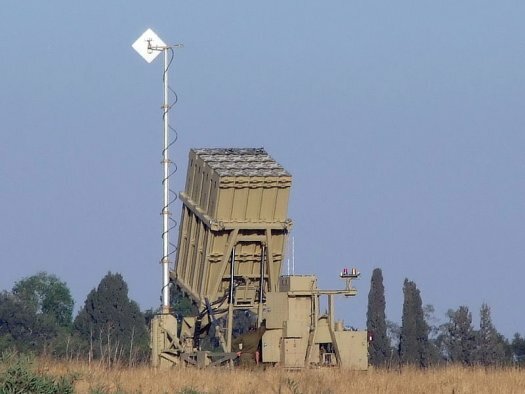 Scientists and pragmatics know there are no quick and "easy" schemes for peace or cardiac "life patches", but apparently Israel's start up nation breeds stupidity in addition to quality ideas. Today, the life patch chief defrauder, Arik Klein was sentenced to 6.5 years for fraud and his partner in crime, Dr. Amos Buchnik was sentenced to community service. (Calcalist). 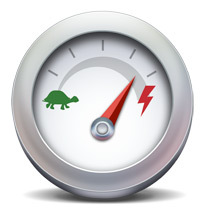 Only in Israel: Bezeq upgrading ADSL customers to 15 MB/s for free! As if the "start-up nation" wasn't high-tech enough -- Bezek -- one of Israel's national telecommunication infrastructure companies, announced today they would be upgrading all their ADSL customers for free. Customers who have 5 or 10 mb/s download speed packages will be upgraded to 15 mb/s. The upgrade will be free and automatic. To take advantage of the upgrade, customers will need to notify their ISP of the speed increase and pay an additional fee (though minor compared to infrastructure) for the increased bandwidth. As you must have heard, Prisoner X, was kept in a secret government jail, and it's forbidden by the censor to talk about him or his incarceration. Here at the Muqata, we've uncovered the real reasons why Prisoner X was arrested. 1. Sara Netanyahu told Bibi to put him in jail in solitary confinement. Making a play on words from the "Leatherman (TM)" multi-use pliers tool, the joke of the knitted kippa crowd is calling the ubiquitous kippa clip -- the "LeatherDOS." I've posted about it before here -- when it was featured in an ad for the "Srugim" TV show. 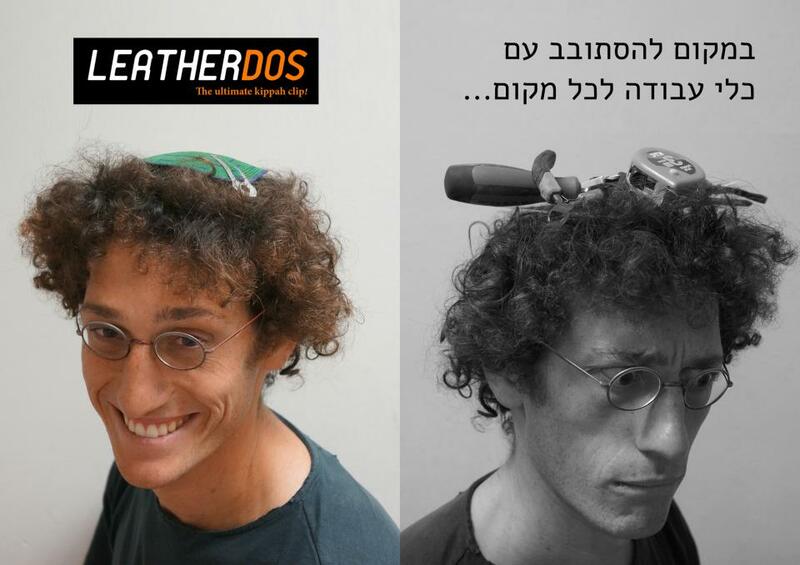 Much to everyone's surprise, Yaakov Goldberg (who isn't religious and doesn't wear a kippa) -- an industrial-design student at the Holon Technical College decided to change the LeatherDOS from a joke to an actual product. "For years I dreamed of an 'upgraded' kippa clip and I always saw my religious friends using their kippa clip for all sorts of things. I decided to take the idea one step forward and prove that one can truly use a kippa clip for any use. Within the framework of my studies, we needed to create something from metal, and this was an excellent opportunity to turn my dream into reality." 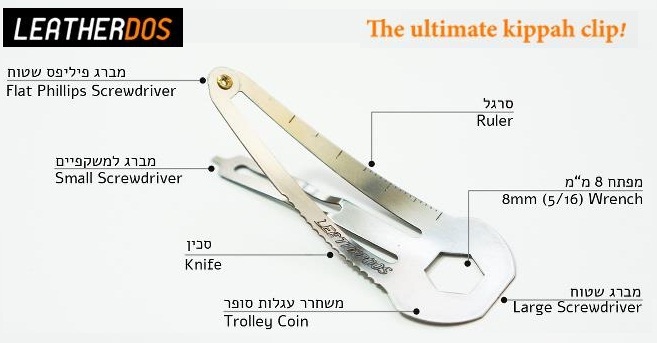 During its development stage, Goldberg surveyed his religious friends and collated a long list of possible uses for the clip and chose the most "practical" -- knife, screwdrivers, coin replacement for shopping carts. To date, he has only made 85 of the clips and is selling them for 25 NIS each. "I know that the regular clip costs about 1 NIS...but everyone who has seen this so far is excited about it and willing to pay the higher price. My costs are high, but if the idea catches on, hopefully I will be able to lower the price". Two of the clips have already been sold on ebay to US buyers for the full price. One day he believes his clip will become the common one for kippa wearers, and he would even want to combine it with USB/disk on key functionality. Goldberg says he needs to consult with a rabbi about the possible "muktza" issues for wearing a USB kippa clip on shabbat (or a multi-tool clip). We wish Goldberg lots of success -- as this item sounds like a winner! You can follow the Leatherdos and get more information from his facebook page. Israel's Chief Rabbinate is working very hard to ensure that Orthodox, Conservative, and Reform Jews are all given equal treatment: Until recently, Conservative and Reform Jews had felt very alienated by the Israel Chief Rabbinate, but Orthodox Jews did not. Recognizing the inherent unfairness in this, for the last few years, the Rabbinate has been taking dramatic steps to ensure that Orthodox Jews also feel just as alienated. Jewish Week: Jerusalem — About 20 years ago, an infant girl (“Nina,” a pseudonym) from an Orthodox family underwent a conversion in New York that, by Orthodox American standards, was and still is beyond reproach. The three converting rabbis, whose names The Jewish Week has withheld so as not to harm their reputations, are highly respected figures in the mainstream Orthodox Jewish world, according to Rabbi Shmuel Goldin, president of the Rabbinical Council of America (RCA). But that hasn’t stopped Israel’s Chief Rabbinate or Israel’s Ministry of Interior from questioning the conversion, evidently because it took place in a synagogue-based beit din (rabbinical court) that did not meet on a regular basis, and not in an external beit din dedicated solely to conversions, The Jewish Week has learned. 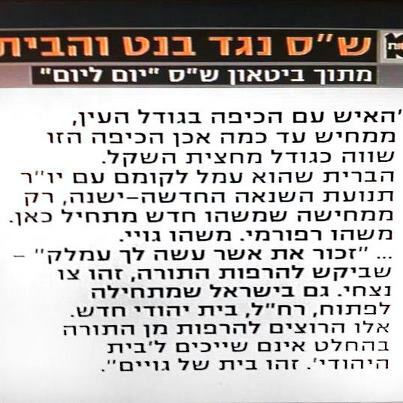 Shas is so proud of these statements, that the official Shas party channel on youtube publicized the video (sorry it's only in Hebrew). The man with the kipa the size of an eye personifies how his kipa is the size of a "half shekel coin". The agreement he is working hard on creating with the chairman of the new-old hatred party [J@TM: Yesh Atid party] shows that "something new is happening here [J@TM, "something new is happening" was the campaign slogan of the Jewish Home party]. Something Reform. Something "Goyish". "Remember what Amalek did to you" which tried to weaken the Torah -- this is an eternal concept. Also in Israel. G-d forbid, a new "Jewish Home" is being created. Those who wish to weaken the Torah aren't part of a "Jewish Home" -- it is a house of "Goyim". The Torah and Judaism survived for thousands of years before the Shas party, and will continue to survive and flourish even if the Shas party is not a member of the government. In fact, based on the situation above, Torah will probably flourish more with Shas out of the government, and hopefully the Chief Rabbinate will revert back to a Rabbinate for all of Israel, with tolerance and justice for all. And till R' Ovadya Yosef publicly apologizes for lambasting the "Jewish Home", the "Jewish Home" party should ignore Shas completely. Got the following from a friend. Any Jewish calendar aficionados out there able to corroborate this? 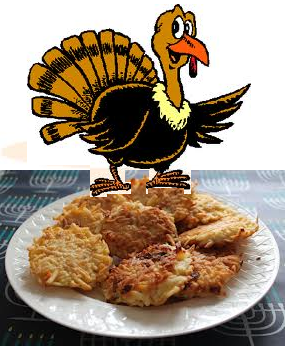 The first day of Chanukah coincides with Thanksgiving, on 11/28/2013. It turns out that it has never happened before...and it will never happen again. Thanksgiving is set as the fourth Thursday in November, meaning the latest it can be is 11/28. 11/28 is also the earliest Chanukah can be. The Jewish calendar repeats on a 19 year cycle, and Thanksgiving repeats on a 7 year cycle. You would therefore expect them to coincide roughly every 19x7 = 133 years. Looking back, this is approximately correct – the last time it would have happened is 1861. However, Thanksgiving was only formally established by President Lincoln in 1863. So, it has never happened before. Why won't it ever happen again? This means that while presently Chanukah can be as early as 11/28, over the years the calendar will drift forward, such that the earliest Hanukkah can be is11/29. The last time Hanukkah falls on 11/28 is 2146 (which happens to be a Monday). Therefore, 2013 is the only time Chanukah will ever overlap with Thanksgiving.